Fire Pro Wrestling Returns, which was released in the West on the PS2 back in 2007 is in my opinion, the greatest professional wrestling videogame ever made. The reason Fire Pro in my opinion is the greatest wrestling series ever made is because they have been able to do something that no other wrestling game in history has done and that is to accurately simulate real wrestling matches and translate them into videogame form. Fire Pro is the most pure professional wrestling simulator around but just because it's a simulator doesn't mean it's not fun. It's just as fast and fun as pro wrestling games from the 2000's, which I assume a lot of people would consider the golden age of wrestling games. I would put Fire Pro R right along side No Mercy, Here Comes the Pain and Day of Reckoning 2 as the Mount Rushmore of wrestling games. It's been over 10 years since a new Fire Pro game has been released for consoles and fans of the series have been begging for the series to return once again. The crappy Xbox Live Arcade Avatar Fire Pro game from 2012 doesn't count. Here we are in 2018 and the Fire Pro series returns again with Fire Pro Wrestling World on the PS4 and for the first time in history, the game comes with actual licensed wrestlers as well from Japan's New Japan Pro Wrestling Promotion. Fire Pro Wrestling World takes everything that made Fire Pro R great and adds to it to create one of the best pro wrestling games you can play right now. Fire Pro Wrestling World is not here to reinvent the wheel as they have used Fire Pro R as a base for this game. The game still utilizes the isometric view during gameplay and still features the same graphical style of the older games. You aren't going to see bulging muscles and veins popping out of the wrestlers like you would in the most recent WWE games but the graphics give the game a certain charm. New comers to the series would probably feel intimidated by the game as this is a game that features a unique playstyle and control system compared to most wrestling games. You need to play out matches like actual professional wrestling matches. To initiate a grapple, simply move close to your opponent. This will initiate the collar and elbow tie up. Once here, timing is key. As soon as the grapple animation finishes, you need to input your move faster than your opponent. This game will show beginners no mercy and if you button mash you will lose every time. You need to start off with your weak attacks. These are simple moves like punches, slaps, hip tosses, body slams and such. As the match goes on, you can then move onto your medium attacks and then you finally move onto your heavy attacks and your finisher. These are your most powerful maneuvers and this is when you can start going for pinfalls. You have your entire moveset unlocked from the start of the match. Technically you could do your finisher whenever you wanted, but the game prevents this from happening by adding in an auto reversal system. If you don't start off with smaller moves and move on from there, you are just going to keep getting reversed. This is also a way to let you know that it's not the time to move onto bigger maneuvers. Another big mechanic to the game is managing your stamina. There are no HUDs in the game so after performing moves, you will need to take a breather. Pressing L1 will allow your wrestler to breathe and recover stamina. If you keep spamming moves over and over you will be in trouble when it gets to the ending of the match as you will be so gassed that you will stay down on the mat longer and it will be harder to kick out of pinfalls. When you combine all this together, you get long and intense match ups that leave you on the edge of your seat. You and your opponent will be completely drained of stamina, barely able to move as you trade heavy moves back and forth, getting near fall after near fall until finally someone gets put down for the three count. Whether playing or simming matches, it is as much fun to play as it is to watch as matches play out like actual professional wrestling matches. Fire Pro Wrestling World also has some new features to the series including the ability to slide into the ring from the outside and back and forth punching battles you see on TV where the crowd chants "Boo" and "Yay" after each punch. 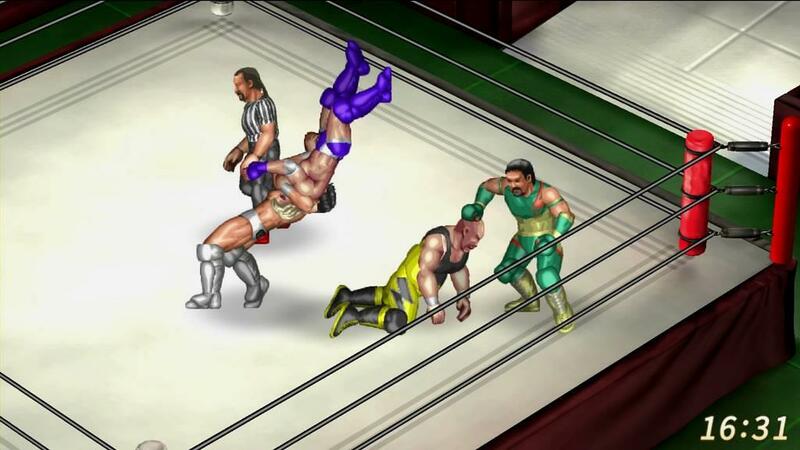 The game features a handful of original, unlicensed wrestlers under the "SWF" banner but for the first time in series history, the game features licensed wrestlers as well from the NJPW promotion. Anyone who is a wrestling fan will no doubt know what NJPW is. They have taken the wrestling world by storm in the past few years putting on some of the greatest matches in professional wrestling history. The series of matches between Kenny Omega and Kazuchika Okada will go down as probably the greatest rivalry in professional wrestling history. At this point they are probably the closest any company has come to giving WWE a run for their money like WCW did back in the 90's. 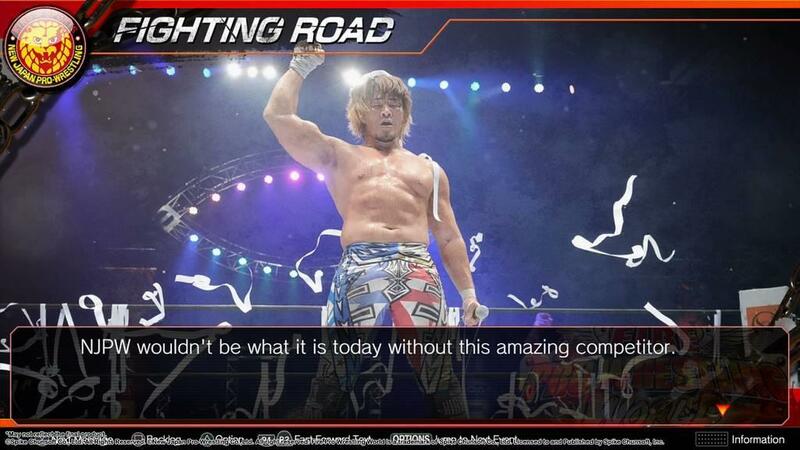 You can play out some of those classic matches in Fire Pro World as both Okada and Omega are in the game along side other popular and well known NJPW talent such as Tetsuya Naito, Kota Ibushi, EVIL, El Desperado, Jack Sabre Jr, Juice Robinson, Tama Tonga, SANADA, Hiromu Takahashi, Minoru Suzuki and many more. All of the wrestlers look just like their real world counterparts, even with the graphic style, and features all of there signature moves and taunts. 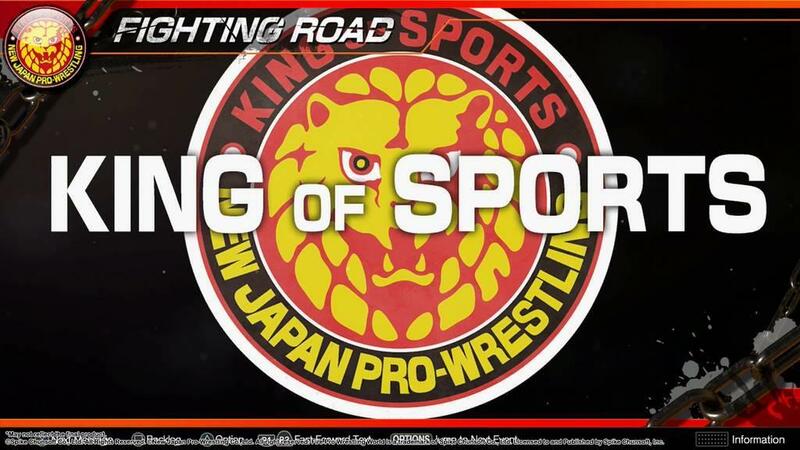 There are even some voice clips from the wrestlers as well and some of the wrestlers will come out to their NJPW entrance music but unfortunately a lot of their real world entrance music isn't used as they are licensed tracks. Either way, being able to play as the NJPW wrestlers is awesome and performing Tetsuya Naito's finisher the "Destino" will never get old. Of course one of the most important feature to any wrestling game is match types and Fire Pro World is packed with them. Of course you have your standards like one on one and tag team matches but there are a plethora of specialty matches as well including battle royal, steel cage match and brutal deathmatch style matches like the barbed wire ropes match and the landmine death match where the floor around the ring is covered with explosive barbed wire. The Barbed wire ropes match is one of my favorites because you can set a timer to make the ring explode at a certain point in the match, which will pretty much leave you and your opponents on the brink of death where a single punch could put someone down for the three count. There are even modifiers you can apply in the options menu before a match starts including options for 2 out of 3 falls, no DQ, submission matches and more. Up to 8 wrestlers can be in the ring at once which leads to some pretty crazy and fun match types. For instance you can do a 4v4 barbed wire deathmatch with weapons all over the ring. Within 5-10 minutes of the match starting all of the wrestlers will all be bleeding like crazy and then the ring explodes and everyone gets annihilated even the referee. You could also do an 8 way elimination battle royal or you can add the timed option to make it Royal Rumble style where wrestlers enter at timed intervals. The game even features one of NJPW's signatures events, the G1 Climax in the game listed as "League" mode in tournaments. In this tournament you create blocks of wrestlers. The wrestlers then face each other in a round robin style tournament where you earn points for each win. After all the matches have taken place, the wrestler from each block with the highest number of points then face each other in one final match to determine the winner. One other fantastic feature is that there are no gender restrictions in the game. Women can compete in any match type, men can fight women, women can bleed and you can even use a female wrestler in the story mode. If you wanted to play Asuka vs. Chris Jericho, you can do so, with CAW's of course. Finally the game also includes some MMA style matches. "SWA Rules" matches are Kickboxing style round based matches where you have to win with a knockout and "Gruesome Fighting" matches take place in an MMA style cage where you have to win by Submission or Knockout. You can even customize special movesets in Create a Wrestler specifically for these style matches. These in my opinion are a perfect addition to the game since those sports utilize wrestling maneuvers and it's fun to download or create mixed martial arts fighters and have a separate promotion featuring them. Speaking of CAWs the one thing that makes Fire Pro Wrestling stand out from other wrestling games is the in depth Create a Wrestler feature. Unlike other games where you select individual sets of clothing for a wrestler, Fire Pro Wrestling World lets you layer different "parts" together to create wrestlers. With the huge selection of different parts, you can end up faithfully re-creating just about any wrestler imaginable. Of course you can select the characters stats, move sets and entrance but the one feature that really sets Fire Pro apart from other wrestling games is the ability to edit the wrestlers AI. There are so many options here where you can fine tune a wrestler to make them act like their real world counterparts. They will taunt, use signatures moves, go to the top rope all just like they do on television and this is what makes watching the matches as fun as playing them. Other creation features in the game include the ability to create championship belts, rings and you can even create your own referees. Want a giant bear to referee your matches? Well you can do that. While it won't be available until the day one patch launches, you will be available to upload and download other players creations including their wrestlers, referees and rings. The create a belt feature is a bit lacking with only a few options so it won't be as in depth as something you see in the WWE 2K games but there are a large selection of official NJPW championships that you can compete for. Fire Pro Wrestling can be intimidating for new players of the series so one very welcome new feature in Fire Pro World is the addition of a missions mode. This mode will teach you all about the ins and outs of the game from grappling to how to perform top rope moves, submissions and such. Once you learn the basics you will be tasked with completing objective based missions like winning with a submission move, winning after using your finisher or surviving and 8 man timed battle royal as the #1 entrant. You can also learn the ins and outs of the game through the all new story mode. 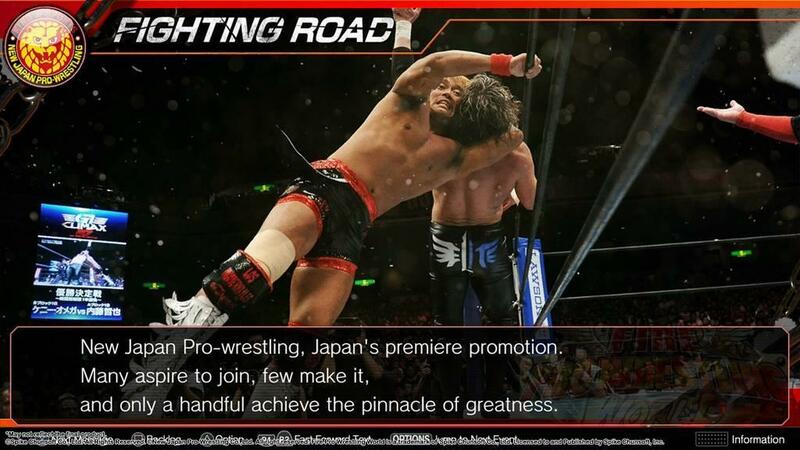 With the collaboration with New Japan Pro Wresting this is the perfect time to introduce a story mode into the game. 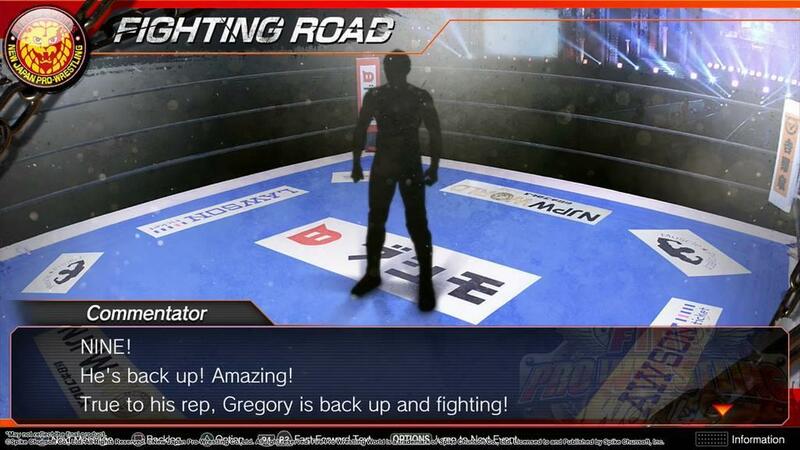 The story mode is called "Fighting Road" and you can create your own wrestler, male or female and take them from a rookie Young Lion all the way to the NJPW Heavyweight Championship. 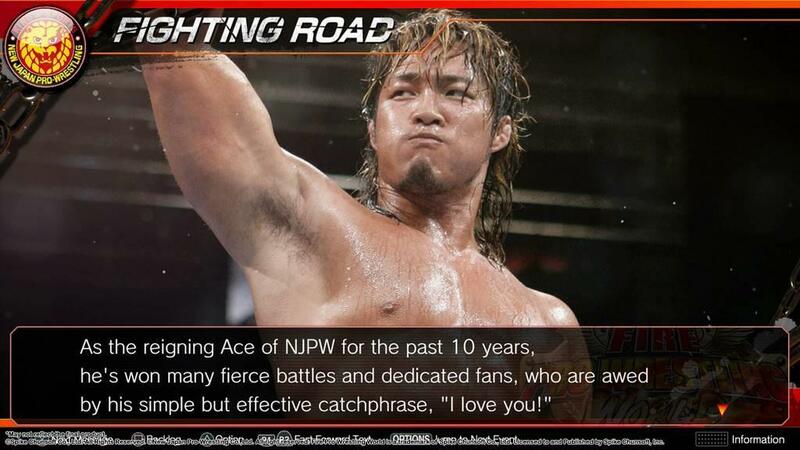 The mode is presented in a visual novel style and you will meet up with and compete against all of NJPW's top talent. It's fun but it's also extremely long. In the interest of full disclosure, I never finished the Fighting Road mode because of how long it was. After about 6 or so hours just in fighting road, I was only finished with about 20% of the story mode but from what I played I really enjoyed. The mode is presented in a non kayfabe style so you get a feel of what it's like to be an actual pro wrestler. 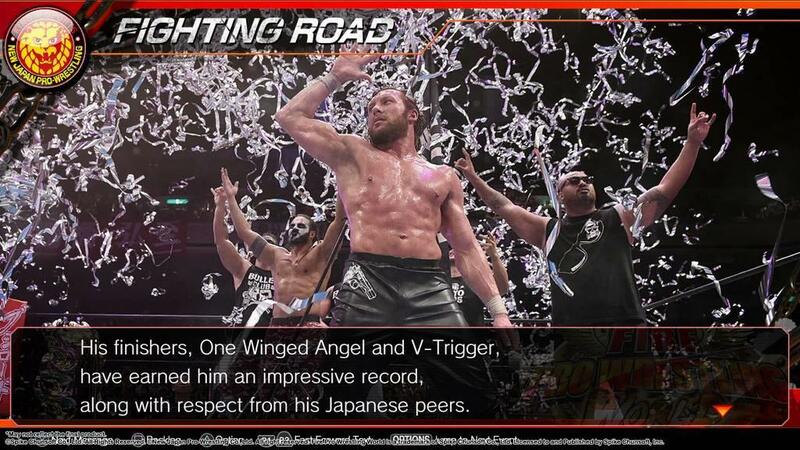 From starting out at the bottom, gaining the respect of your peers, moving up the card, being sent to different promotions to hone your craft, and coming back to NJPW to become the top star of the company. The great thing about the story mode is that a lot of the matches can be won or lost and are more about entertaining the fans than getting wins. It's also cool to see NJPW talent critiquing your matches all while earning their respect. Fire Pro World isn't without some faults. One big step back in Fire Pro World compared to Fire Pro Returns is the huge lack of variety when it comes to music. There is no commentary in the game so you can have music play during the matches. Unfortunately, Fire Pro World only includes three tracks that can play during matches and as far as I can tell, there is no way to set it to random. So if you don't want to keep hearing the same song play during matches over and over again, you will have to go into the options menu every time you want to change it. Fire Pro Returns also had a large selection of music to use during matches. Also submission moves are a little anti climactic as you don't get any indication of whether or not your opponent is going to tap out or not. You just apply the submission move and hope that your opponent taps out. Fire Pro Wrestling World took what was great about Fire Pro R and expanded upon it to create the definitive Fire Pro experience that's going to grow even more in the future with the Fire Promoter, a mode where you manage your own wrestling company, more NJPW wrestlers and a new story mode via DLC. The name Fire Pro World is so appropriate for this game because the love of professional wrestling is something that can bring the world together. We sit in awe and watch artists tell us stories in the ring. It is something that myself along with millions of other fans love and enjoy, and it's right there in the title of the game, "world". Fans from all around the world all come together to enjoy this sport known as professional wrestling.